With the Park and Recreation Finder application, residents can find a park near them or a park that has activities that interest them. What do Fort Lauderdale, Florida; Lake County, Florida; and Cabarrus County, North Carolina, have in common? All three local governments saved time and money by implementing configurable applications instead of developing those applications from scratch. Esri’s ArcGIS for Local Government maps and applications offer quick and configurable solutions for common web mapping needs. An attractive alternative to creating new services from the ground up, they can refine internal workflows and provide new services to the public. All of the nearly 100 applications can be downloaded at no charge from the ArcGIS for Local Government Resource Center and are built on the Local Government Information Model. Since 1999, the GIS division of the City of Fort Lauderdale has delivered geospatial services internally to city staff. With a population of more than 168,000, Fort Lauderdale is the largest city in Broward County. Recently, to meet growing demand by public and internal customers for increased transparency and additional services, the division began investigating the templates and applications available from the ArcGIS for Local Government Resource Center. 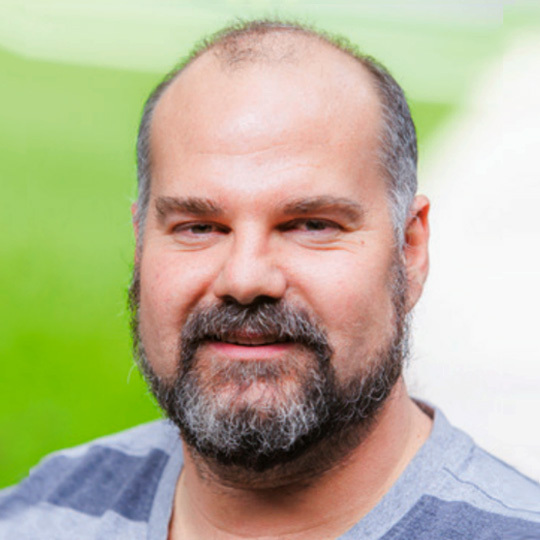 GIS manager Ian Wint and his staff discovered that simply by configuring the templates, the city could rapidly expand its collection of mapping applications in a fraction of the time that it would take if the city developed web maps from scratch. The city’s aging Parks and Recreation application, based on ArcIMS technology, was selected as the initial project. Residents value the park system, and proximity to a neighborhood park positively affects property values. 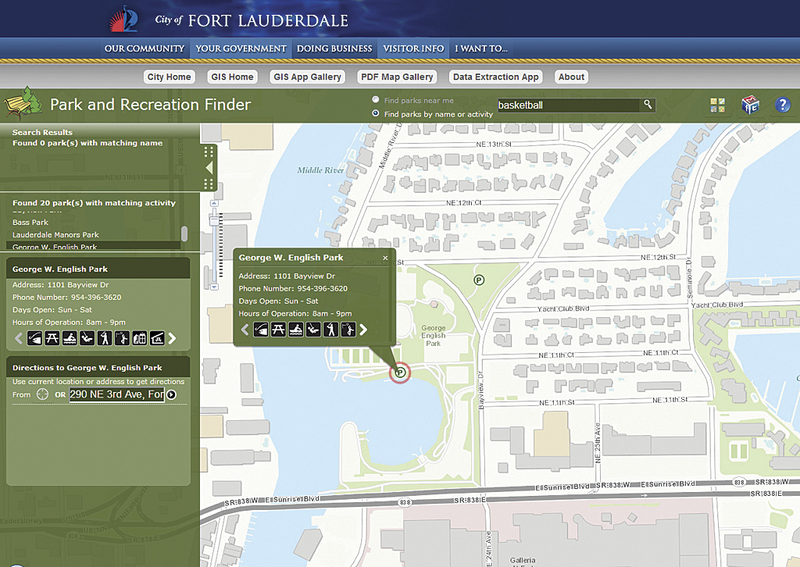 Within a week, Fort Lauderdale’s GIS division had migrated its old Park and Recreation database schema over to the new information model and stood up the Park and Recreation Finder, which lets residents find nearby parks, either by address or current location or by activity (such as basketball). Using Lake County's My Public Services application, residents can find information on everything from trash pickup to nearby health facilities. Since publishing its Park and Recreation Finder application, Fort Lauderdale GIS has added several new ArcGIS for Local Government-based applications to its existing web mapping application gallery, and more applications are planned. Lake County, Florida, needed a better way to inform both new and part-time residents about county services. It is the home of more than 1,400 named lakes and more than 300,000 residents. Although some information had been available on the county’s interactive map, the GIS division wanted to provide applications that addressed specific needs. Lake County’s GIS programmer/systems coordinator Keyetta Jackson heard about Esri’s local government preconfigured applications at a local user group meeting. 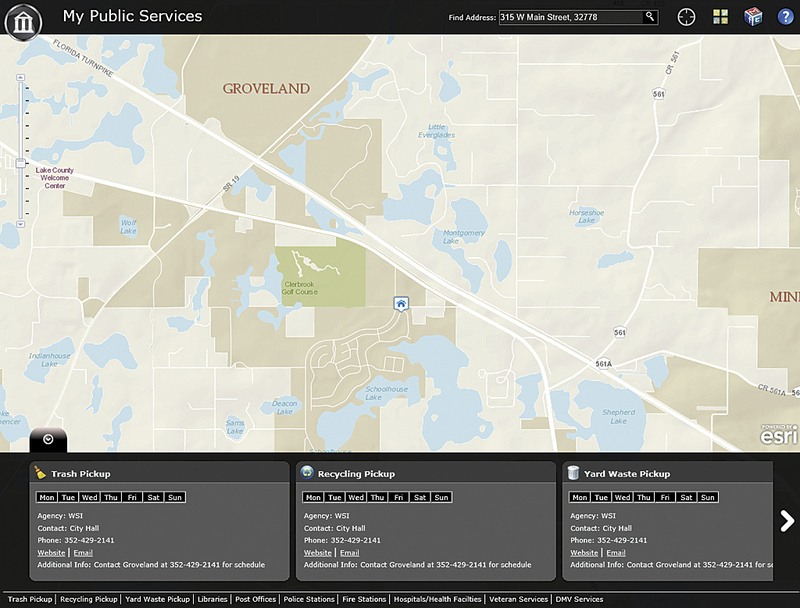 She downloaded the My Government Services template from ArcGIS Online and, after updating the county database to conform to Esri’s Local Government Information Model, had a new Public Services application published on Lake County’s website in less than a week. “The Public Services page works better than we imagined,” said Jackson. “It provides our customers with a nice-looking interactive display, intuitive controls, and a scrolling window showing all the available services.” Depending on the type of service, each tab includes contact information, driving distance, and links to websites of the particular service provider. “The beauty of the template is that it minimizes development time,” said Jackson. “I would have spent hours just making design decisions and developing my own code.” Developers can still modify the modules for a more custom appearance as they see fit. For instance, Lake County’s page also displays nongovernmental services, such as hospitals and health facilities. 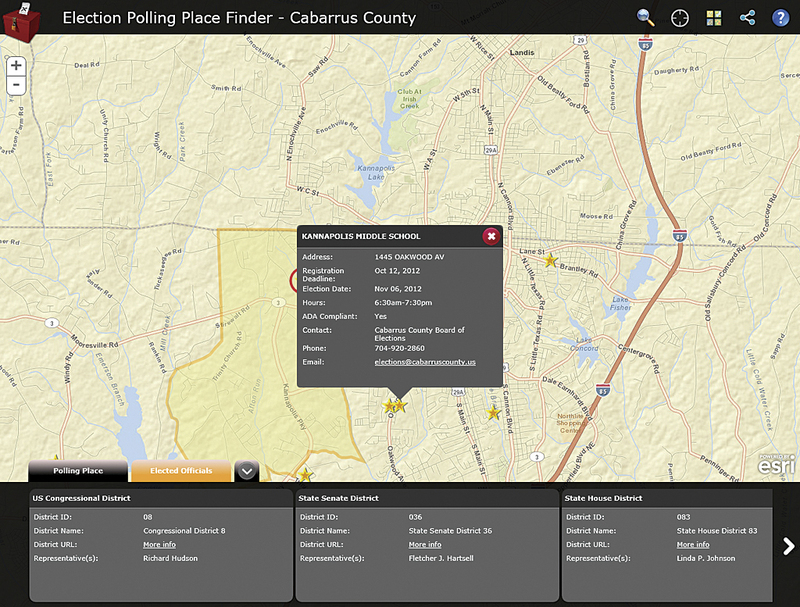 Cabarrus County's Election Polling Place Finder gives the location, hours, accessibility, contact, and other information for each polling place, eliminating countless phone calls to the offices of the Board of Elections. Voters need to know where to vote. With an estimated population of more than 180,000, that meant a lot of calls to the Cabarrus County Board of Elections office. To reduce the number of calls, members of the GIS staff at Cabarrus County, North Carolina, implemented Esri’s Polling Place Locator template. While visiting the county, Esri developers had demonstrated the templates, available at no charge from the ArcGIS for Local Government Resource Center, that can be used to rapidly create focused applications. With major elections approaching, the polling place locator—which helps voters by identifying their polling place—seemed an obvious choice as the first application to implement. “Within a week of discussing how we could improve our service, we were demonstrating the completed application to our Board of Elections,” said Zachary Woolard, GIS administrator for the county. “Starting from the ground up with no framework or guidance would have taken much more time and considerable effort to get the data to display on the map.” The HTML-responsive design of the Polling Place Locator template also allowed Cabarrus County to deploy the application in the iTunes and Google Play stores. Since publishing the application in 2012, the county has experienced a significant drop in the number of phone calls received by the Board of Elections. The application, which was both successful and relatively easy to stand up, encouraged the county to publish the Parks Finder application and a maps and applications gallery page. All three local governments created polished, responsive applications that meet specific needs in a short time frame. See what resources are available and get started. 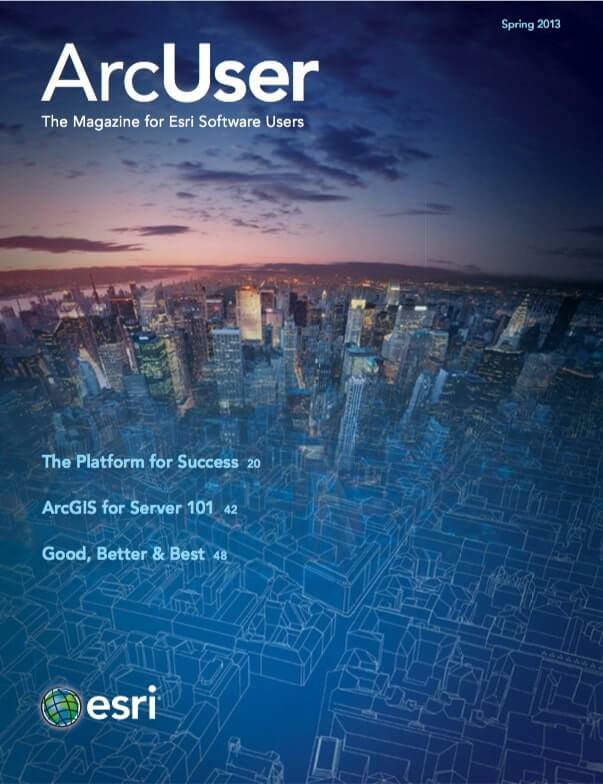 To learn how the ArcGIS Data Interoperability extension can streamline migration to the Local Government Information Model, see “Making Data Fit the Community Maps Program: Migrating to the Local Government Information Model” in the Winter 2013 issue of ArcUser.